Earn $8.88 in VIP credit (888 points)What's This? 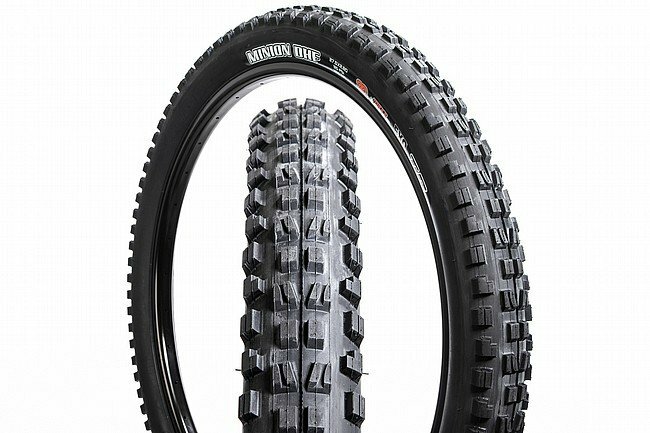 Maxxis Minion's DHF PLUS 29+ 3C/EXO/TR MTB Tire is tubeless ready with a front-specific tread pattern, 3C MaxxTerra compound, and EXO puncture protection. 3C MaxxTerra is soft, offering more traction than 3C MaxxSpeed yet better treadwear, and less rolling resistance than MaxxGrip. EXO Protection is a densely woven cut- and abrasion-resistant material added to the sidewalls of the tire. Made my Trek Stache one mean machine! Got these to replace my stock Chupacabras on my Trek Stache 5. I ride a lot of more technical trails that are either dry and sandy or muddy as heck. I noticed a difference immediately vs the stock tires in regards cornering and overall handling. I can really duck into corners now without feeling any slipping and I feel like the whole bike sticks to the ground a little better. In the mud, they keep me upright most of the time. If I hit a curve with some thick mud, they give me an extra second or two to catch myself before I eat it. With my Chupas, I would be on my face before I could get a foot out. They do get HEAVY in mud as they really cake and hold it. Overall, love the tire. Pump it up for mud and keep it squishy for dryer conditions and rocks. It also makes my bike look MEAN! Love this tire!!! I put a set for back and front on my Salsa Deadwood!! 29 3 wide goodness!! !